I enjoyed book one and was pleased to see a fleeting appearance of Chase and Zoe here 😉 I love when that happens. 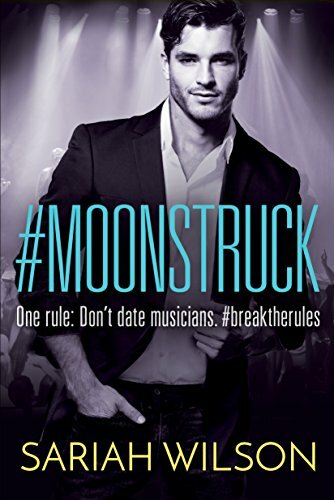 So, Maisy has a dilemma, she’s a Rule, No Musicians – Ever….and yet now she and her brothers are on tour with Ryan de Luna she’s struggling. It was pretty easy at first, he has a reputation as a man-whore and jerk, she knows his type and it wasn’t hard to brush off his advances. That seemed to shock him, usually he only has to glance and the Pleeches ( Maisy’s term for the type of groupies that follow him) are desperate to shed their (minimal) clothes, do whatever he wants so he’s a bit intrigued by Maisy and her indifference. To start with I thought he was a jerk too. In a way when everyone around is pandering to you, telling you what they think you want to hear, not whet you need to hear it must be difficult to be “normal”. Ryan’s trying to change though, tired of that rep, tired of doing the same music just because it sells, but his label love it because it brings in the money. He loves the way Maisy treats him just the same as anyone else, no special treatment, not afraid to call him out, tell him he’s wrong. As she gets to know him she can see beyond the face he presents and when he asks for her help she agrees. By then she’s pretty much been sucked in by his charm and just wants to help him achieve what he wants with his music. I liked Maisie – and her brothers. They’ve had a tough life, work hard with their band to create and play the music they love, and all have other jobs to support the family, keep their home, and pay their mothers health costs. This gig is the chance of a lifetime for them, pays really well and hopefully could lead to financial security, so they’re a little worried about what happens if Maisy and Ryan split. Will they lose the gig, can they afford that risk? They can see that both have feelings for each other so the “fake” girlfriend thing isn’t going to stay that way for long. Its got some great drama in, and like book one has a nice twist at the end. I thought I’d guessed that – I was wrong, it wasn’t who I thought but someone I’d never imagined. Like I said before I love to be surprised. I did think Maisy over-reacted a bit but the story needed that to create the drama, and given the type of person she was and her fear of Ryan being like her father, it wasn’t that much of a stretch to believe she would have done that. Stars:Four, another fun and real feeling read.